Wondershare AllMyTube is more than a smart YouTube downloader–it’s a high-quality YouTube converter, too. With this and many other essential features, AllMyTube can make your movie watching experience worry-free, so you can just enjoy more. – Downloads videos from YouTube, Hulu, Facebook, Megavideo, Vimeo, Metacafe, VEVO, Liveleak , etc. more than 100 video sharing sites. – Extracts MP3 from YouTube, convert downloaded videos to all popular formats and devices like iPad 2, iPod touch, iPhone 4S, Android, etc. – Now download videos 3X faster from hundreds of video websites. 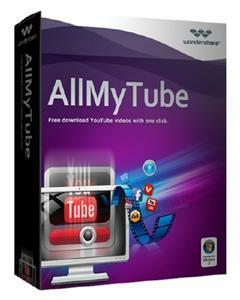 – A whole lot more than YouTube: Besides YouTube videos, AllMyTube downloads videos from over 100 video sharing sites, such as YouTube, Google Videos, VEVO, Facebook, Dailymotion, AOL, Metacafe, MegaVideo, Vimeo, Break. BlipTV, Veoh, VideoBash, LiveLeak, MyVideo, FunnyOrDie, Nico Video, etc. – Download via Download Button: Automatically detects the video when it starts to play. Download video by clicking the Download Button on the top of the video opened on IE, Firefox or Chrome. – Copy and Paste URL: Copy and paste URL of the video to download the target video. – Raw Recording: Record the video whilst it?s streaming (i.e. Netflix, Hulu Plus) by launching the Video Recorder. – No wait to download videos: By using the multithreading techniques, make full use of your bandwidth and computer to get YouTube video in no time. – Task Scheduler: Instead of waiting for your long list of videos to finish its download, choose any out of the 3 scheduler options that fits you; Auto Shutdown, Enter – Sleep Mode or Exit Program. – Converts YouTube videos to popular video formats: Converts downloaded videos to MP4, AVI, MPG, MKV, WMV, M4V, MOV, ASF, DV, etc. It’s the all-in-one YouTube video converter! – Converts online videos to multiple devices: Converts downloaded videos to iPod, iPhone 4S, iPad 2, PSP, smartphones, etc. friendly video formats. – Extracts original audio from YouTube: Tears audios off videos and save as MP3, M4A, AC3, AAC, WMA, WAV, OGG, APE, MKA, AU, AIFF, FLAC, M4B, etc. – Built-in video player: Double-click a video in the Library to play it. – Video library: Automatically saves downloaded videos and allows users to import local MP4 & FLV videos to the Library. – Share videos to Facebook & Twitter: Click the Facebook or Twitter icon in the Library to share downloaded videos with friends.